Mike Ragogna: Rob, thank you so much for joining me. 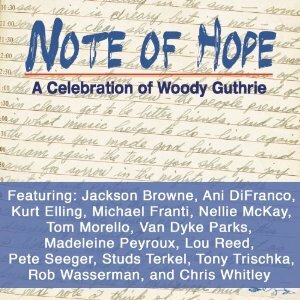 What got you on board for the project Note of Hope: A Celebration of Woody Guthrie? RW: Woody's daughter Nora Guthrie approached me when I was doing a Robert Johnson tribute concert at the Rock 'n' Roll Hall of Fame. I was doing a solo bass piece for Robert Johnson, and she came up to me afterward and just out of the blue asked if I would work with her dad's words from journals -- not lyrics, but words from journals. They were mainly unpublished, and she wanted me to bring them to life again with the bass. I was really surprised and happy at the opportunity to do it, so I immediately said yes. MR: How did you assemble the artist roster and, in general, what was the process like working with them? RW: Basically, I'd find the artists and invite them. Nora would suggest words that she thought would work for them and that they might be interested in, and then, before we got in the studio, they would choose words to work with. So, that's sort of the process. But musically, some of the time, it was created in the studio between me and the different artists, and other times, people would bring in music. I kept it pretty flexible; I just wanted to have everyone carry their enthusiasm and be passionate and true to the words, and it was challenging because they're not lyrics. The piece with Jackson Browne was 30 pages long in the journal, and the challenge was, how do you turn that into a song? MR: I guess it was Nora who had the most input as far as the editing process? RW: With the words -- not the music, but the words. Most of the time, it would be the artist asking if they could have permission to do that. Sometimes, she edited too in advance; if it was really long she added her own edit. But most of them just did it on their own with her permission. MR: What is your approach when you're actually in the studio with your artists? Like, when you did this album, was it a little more structured? RW: It was track by track. Some were really structured. With Jackson Browne, it was pretty spontaneous. We just sat down and started jamming, and the sound came out. Lou Reed composed before he came into the studio. Chris Whitley was really a raw jam. You know, everyone was different. Michael Franti and I just did it from scratch. Tom Morello prepared something. With Studs Terkel, Nora went to him, because he was already ninety-something, and she recorded him in his home... his kitchen, I believe. And then I just set it to music, like a film score. MR: By the time you were approached by Nora, I'm sure it wasn't the first time Woody Guthrie crossed your mind. Did you admire him and his body of work? RW: From the time I was a teenager, actually. I read one of his books and was very inspired by him. He speaks to the passion and the joy and suffering of humankind. He gives a voice to those who often have no voice. I always loved that. To me, he was an inspiration. It wasn't that big a surprise to me that I actually got to do this. It was a surprise that I met Nora like that, though. But before I even played music I was listening to Woody's music. He was way more than a singer/songwriter; he's an inspiration to a lot of people. He helped them. His music offered courage to a lot of people in the whole country. He was very courageous. MR: A real contributor and cultural icon. RW: Yeah, he was courageous. He just said what he felt, and loved people. A lot of his albums reflect that, and the words Nora chose, I think, reflect that. The timeframe in which he wrote the words was from the early '40s to the mid-'50s when he was living in New York. He actually was very mature as a writer. Nora wanted us to be more challenging than other projects she'd commissioned by offering something that wasn't just pre-fabricated. It's a lot easier to write the lyrics. We had all these words, and they had stories and messages, and they speak to what's going on today, which is really interesting. With destructive cyclical things, often, we'll find ourselves in times where voices are not being heard as they should be, and it's like Woody's songs for the future. MR: Beautifully said. You talked about the Studs Terkel experience, and a little bit about the Jackson Browne experience. Can we talk about what it was like being in the studio with a couple of the other artists, for instance, Lou Reed? RW: That's someone I've worked with a long time. He goes into the old friends category. He prepares. He jams, but he comes to the studio very prepared for the session. He did the music, and he and I arranged it together. We made up string parts and all that, but it was just the two of us, which was really fun. I'm used to working with him. He's a longtime musical connection and friend, and I thought he'd be really great on this, and it turns out he really found some words that he wanted to sing. He actually edited it and added some more of his own words to it, so it's more of a fusion. His are the most personalized of all the words. MR: You guys go back to the Duets album that featured artists like Bobby McFerrin, but I'm assuming you have a longtime friendship with them now as well. RW: Actually, that was a fairly long time ago. I met him in the mid-'80s, a few years before Duets came out, and we ended up working together all these years, from the New York album to various other albums, and we just did a long tour of Europe. Some of the artists I wanted to invite because I knew them and I felt that would create really strong songs, and with others, it's part of the joy for me to also bring people I haven't worked with into the project. That makes it challenging and fun also. MR: And there's your Trios project that also features a lot of great artists -- Neil Young, Elvis Costello, Bruce Hornsby and Edie Brickell whose track is my favorite on the album. MR: I want to get into your musicianship at this point, your creativity. Are you able to pinpoint how it happens, how it flows out of you? RW: I've always started from my perspective as a bass player, and I think that being a bass player, I often tend to connect to the people I'm working with in a supportive way. That's what makes these things work. I think that I'm trying to make the song better and not just make myself look better, but actually support someone. But some of these things I'm thinking of are many film scores. Actually, I just moved to LA, where I'm pursuing my lifelong love of composing music for film. MR: I imagine with you it's just a matter of word getting out, knowing that you're available to do that. I imagine they'd be knocking on your door. RW: If they can find my door, yeah. MR: (laughs) Are there movies that are out there where you see them and you go, "Oh, yeah, I could've done the score on that one." RW: Yeah, there are many more movies that center on acting and screenwriting, rather than effects, and a lot smaller, more artistic films. Woody Allen would be great. I like to write based on what you've heard my records to be. I like to write for small ensembles and feature the upright bass a lot as one of the voices. That's my plan. My wife Veronica and I have started a new production company, so we're going to be doing the film scores and storytelling projects. Creatively, I've always approached it from the bass first and thought of the bass as a voice, and that's often why it sounds like that when I'm doing duets and trios and things. MR: To me, your voice always comes through the instrument without it ever overshadowing whoever your vocalist is. RW: That's really important to me. Sometimes, you really have to let your ego or your self disappear because otherwise, you can't do a great tune. That's challenging because everyone I've ever worked with wants to be featured in some way, but it's best if the producer and the musician know the right balance. And in this record, it's as much about the words, if not more about the words and the message of the words. MR: On Note of Hope, you recorded a song with one of my favorite artists, Ani Di Franco. What was that like? RW: She chose those words. We had a couple choices, as many as we needed, but she settled on those words. I went to her place in Buffalo. I often went around to different people's home studios to make it more conveniently comfortable for them. Ani DiFranco and I created the music from scratch in a couple days. That was a really fun session, I remember that. It was very experimental and avant-garde, and I thought she helped paint a really good picture of the words. MR: You also feature Madeleine Peyroux. RW: Yeah, she's perfect. She wrote the music before we got in the studio, and we put it together in the studio. Some of the artists, like I said, really wanted to come in with a couple of comfortable recordings, being prepared and having the music come from them so they could sing it, and I decided that's fine. I wanted it to be the best record it could be. I like to collaborate the most; that's my favorite thing, so on songs like that, I collaborated more on the bass playing -- some instrumental stuff, and just arranging. But she's great. Has a great career, I think. There were some really great musicians who came in. MR: Rob, has there been a project that approaches someone's works -- in this case, Woody Guthrie -- that's even close to something like this? RW: Well, none of Nora's projects. She wanted something really different, and that's why she picked me -- she wanted to come more from an upright bass perspective. But I didn't want to limit it to that; I wanted it to bring the words alive and not make it a spoken word record, because that would've been easy. The challenge is, how do you turn thirty pages into a song? That's my big question. Somehow, with Jackson Browne, we were able to do that, and with all of the other pieces. But I don't know if there are any other records like it. MR: Yeah, I can't think of another project that took this approach. What advice would you give to new artists? RW: Just be true to music. In this case, it was starting with words. Think about the flow. I see a lot of musicians traveling that are more into presentation than the actual concert. Just focus on what you're trying to say. In my case, a lot of it's been instrumental music, starting with the solo bass record, and now I'm going for film scores. I just focus on the actual music for film, telling the story of the film. Don't focus on how shiny the bass looks or how fast you can play; focus on the feeling of the music. MR: That's interesting. Here's another name I was going to throw out earlier: Joni Mitchell, who I love dearly. This album kind of does the reverse of how she approached her Mingus project. RW: I love her too. Mingus actually was the first upright bass player I ever heard, and my original inspiration for playing the bass, so it's interesting you said that. MR: Will you be part of the concerts that the Woody Guthrie Museum is setting up? RW: I believe I'm going to be, but I don't know much more than you do about when or where or anything. But that's the plan. We're trying to get some of these artists involved in those concerts. MR: How do you think Woody Guthrie going to be remembered, let's say 50 or 100 years from now? RW: He not only saw the present, but he did see the future, and the things that we're talking about in this record, that he wrote about, are definitely going to be the challenges of the future too. People having a voice in the government, and not losing that. He was one of the first to stand up against corporate takeover of America when it was just starting; it wasn't even defined. He wasn't afraid; he was fearless, and I really think that he's always going to be an inspiration. He gives courage to a new generation of voices that need to be heard. I think his words do that, and I've only seen a fraction of what he wrote; he wrote like three thousand different things and pieces, and in a short life he saw so much, but he was really present and there with people. I think he's just really vital, not just in his vision, but as a spokesman for America. MR: Are there any Woody Guthries out there now? RW: There probably will be, but that's something that time will tell. Some of the artists on this record are certainly inspired by him. But that's a big thing to say. You could definitely say that Studs Terkel and Pete Seeger are right up there with him. As for the younger generation on this record, Michael Franti and Ani DiFranco speak to the people in that sense. MR: It seems that currently, Bruce Springsteen has taken on that role a bit. RW: He was very inspired by Woody Guthrie, and so was Bob Dylan. There are other people. If you're talking about the younger generation, I don't know. But we need it sorely right now. These are pretty dark times. MR: Well, that bring us to the question is there anything in particular catching your eye in the news? RW: Just about everything we're all worried about. I'm not a political person, but I appreciate all this stuff. My main concern is that we're going for people that say they're for the people but really are just running corporations that don't care about people, and I don't want that. I think that's the one thing Woody hated and despised. Now, we've got all these people who say what people want to hear, but they don't mean it at all. I'd love to actually see Woody's reaction to some of this if he were hear right now. MR: And there are people who invoke his name who actually have the nerve to do that when they can barely spell his name. RW: He was very popular in that he was very unpopular because of his affiliations, and he was called all these things -- you know, socialist, communist, and all of that. But he was just a brilliant observer of what was going on. I don't think he'd think things have changed much, except for maybe automobile styles and computers...you know, technology. One thing that was neat about this record is that I got to work with his notebooks, and he drew sketches on almost all his lyrics. It was really beautiful. It wasn't just the words that were beautiful; it was the pictures, and that's something that really helped bring the words to life for me, to see what he was thinking, what he was sketching on his typing and his handwriting. MR: What kind of sketches? RW: Cartoons, little figures. They're all going to be in the packaging. We copied all that. MR: Nice. I have to confess I'm a huge fan of Woody's son Arlo also, and he seems to have disappeared from the culture. He has a song called "Massachusetts" from his brilliant Amigo album that, I think, is one of the most inspiring anthems I ever heard. I thought he was going to inherit the reigns, but everybody gets to choose their own lives, you know? RW: Yep. Yeah, I don't know Arlo really. I've met him a few times. He's great he's terrific. He does his own thing, and he's really true to himself. Nora's a brilliant caretaker and curator of her dad's words, and the fact that she's creating these projects with all kinds of people -- it's really terrific, because it's a way to get the words out there in a way that would have never happened originally. One other thing I should mention is the title track, "Note of Hope." Nora suggested that I listen to those words -- actually, she gave me a couple options, but I liked those words -- and write a solo bass piece just from being inspired and reacting to the words. So, I wrote that piece, and then I thought I'd take it one step further and collaborate with Van Dyke Parks kind of orchestrating, so that's why I have it. That's the one piece of pure instrumental. MR: It's beautiful. I really appreciate your hanging with me today. All the best, Rob. RW: Thanks for the interview. Mike Ragogna: Dan, how are you? Dan Zanes: Alright, glad to be here, Mike. 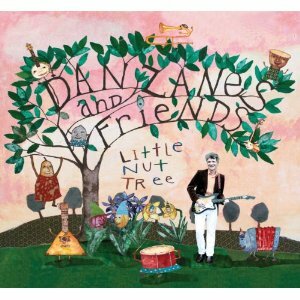 MR: Dan, you work on various projects with different themes, but isn't Little Nut Tree the first Dan Zanes and Friends album since 2007? DZ: Yeah, that's right. We've done three records since then, but we haven't done our classic "all ages" format where it's a mixed bag of tunes from different places with a different range of guests. We've done some theme albums, but this is the kind of record that got us going and it's what we're best known for. We won a Grammy in 2007 with Catch That Train, but we haven't done one like this since then. It was pretty exciting to get back to this, this is kind of what we do best. MR: Can you tell us about some of the fun guests you had on this record? DZ: Yeah, that's something that we've always tried to do. The first CD that we did was Rocket Ship Beach and we had Suzanne Vega, Sheryl Crow, G.E. Smith and, you know, whoever was around. We've been doing that ever since. On this one, we've got the Sierra Leone Refugee Allstars, Sharon Jones, Andrew Bird, and Joan Osbourne... just some old friends. It's a good mixed bag, and the guest part is fun. We've had everyone from Phillip Glass to The Blind Boys, to Angelique Kidjo, Matthew Broderick, and Carol Channing. It's just a pretty great thing to be able to bring these people in. MR: It must also be great to be able to educate and introduce people to a lot of these artists. DZ: Yeah. For me, because I'm such a fan of everybody, it's also a chance to hang out with people that I love. It's always recorded fairly quickly, and we always say it's gonna sound like Lou Reed came over for dinner and afterward, we pushed back the chairs and sang a tune. That's sort of our concept, and that's not the way that most people are making their records, so it's a chance for them to be heard in a more natural setting. MR: When you're approaching a project like this one, are you doing it with a specific concept in mind or do you think of it as more of a collection of songs? DZ: Well, I think of it more as a collection of songs. Everything, from the beginning, is made to sound like it's something from the neighborhood. I live in Brooklyn, and that's its own world. I grew up in the white mono-culture of New Hampshire, so it's taken me my entire life to learn about the big world, that's the exciting thing. In music, there is so much integration, there's so much exciting music and information swirling around that it's a very different climate musically than where I grew up. It's actually hard these days to find a white mono-culture and I think we're all the better for it. As a musician, I think it's really exciting, so that's what we try to keep in tune with. On this CD there's a Haitian song that a friend of ours taught us, and he taught us a lot about Haitian music. We even play an Arabic song with a Palestinian friend of ours, so it's a natural music sharing between friends. I also think of this as all ages music -- I don't think of it as children's music, although that's how it is oftentimes seen because children are such a big part of the audience. I'm okay with it being referred to as children's music, but that's really not the intention. The intention has been to try and make "all ages" music that can be a shared experience between young people together. That's also pretty exciting. I don't think kids need to understand every lyric of every song, and it's not about their experiences anyway. It's really about experiences that are universal to all of us. Children's music, for example, is specific to the experiences of children, but on the other end of the spectrum are the rock songs that are about partying and staying up all night drinking. So, we try to live between those two ends of the spectrum. The challenge is to write songs that work on a few different levels. MR: Right. Your song "Wake Up" is a great example of that. Another song that I particularly enjoy on this album is "Summer Trains," where you share your experience of seeing your daughter grow up. Can you tell us about that? DZ: Yeah, I couldn't help it. At that point, she was 16 and she was four when I started doing this. It all went really fast. One of the best pieces of parenting advice that was given to me that really meant something was to enjoy it because it's so fleeting. I think we all feel that way. You think you're going to be changing diapers for the rest of your life and then all of a sudden, your daughter asks to walk to school alone. (laughs) There are some crazy changes that you have to grapple with. That song is just me reflecting on some of the great things that we've done together, including going to Lollapalooza together last year. (laughs) It's all fun stuff, every stage of the way and that's what I'm trying to get across. MR: The way that you A&R records is related to your daughter, isn't it? DZ: Yeah. I get a much different response from her now that she's 16, though. (laughs) First and foremost, I have to like a record because I'm going to be the one singing in it and I have to be able to relate to everything. But then I also go to her for her opinion, and a lot of times, she'll shut things down and tell me that it's not going to be an interesting song to anybody. She's very blunt, you know? (laughs) I think she actually enjoys telling me when I vere off track. But she's been really great lately... it's really been amazing to have her as a part of this. DZ: (laughs) That's right, Mike. It's the old fashioned way -- it's homespun fun. That's what we're all about. That's also been the underlying message of what I've done since the beginning. I've always wanted to get across that music-making and enjoying music is something you can do in your homes with each other -- it's not something that was just meant for professionals. I mean, I like my job and I wanna keep it, but everybody could be doing this is one way or another. And the point of this is that we should all participate. I think that song captures the essence of that -- it reminds people that you could be playing music and having a party in your own basement. MR: That's a great message, especially with all of the technological distractions. MR: Can you describe what a live Dan Zanes concert is like? DZ: Well, we wanted it to be as much like a little Grateful Dead concert as possible. In other words, we don't expect anyone to sit quietly in their seats. There's a lot of dancing, usually right from the first song. There's also a lot of singing along -- it's a very communal experience. I like to think of it as more of a party than a concert, and my band is so amazing -- men and women, all from different backgrounds -- so everybody brings something new to the table. There are lots of spirited and talented players working with me. So, there's good stuff going on onstage and some great stuff happening offstage as well. Every show is different, because the audience is such a big part of it. It really depends on who is in the audience because that's what steers the emotions of the whole evening. MR: Do friends come to you and ask that you write songs for their kids or families? DZ: I really don't get much of that, no. (laughs) My dentist is always telling me that I need to write songs about going to the dentist. (laughs) He brings that up every time I'm there. He even, at one point, stopped in the middle of a procedure to go to my website and check my tour dates. (laughs) He's very vocal about it. MR: Very scary, I'm now traumatized of dentists by extension. (laughs) Are there certain subjects that you enjoy writing about? more often than not? DZ: Yeah. I think friendship is a great subject for me, because it's so wide and expansive. And if you're listening without a kid, I think you may find that the songs can be kind of romantic in some ways, which I think is always nice. I mean, if I'm by myself, I like listening to songs about romance. But, I think it can be sort of open-ended. The natural world is another great subject for me because there's so much to it. It sounds kind of dry talking about it, but I love singing about it. Then, I think, trains symbolize so much. On planes, you're all buckled-in and you can't even walk up and down the aisles, but on a train, you can wonder around and eat and watch things pass you by. I think trains have been a big part of American mythology since they were built, and I'm just as caught up in that as anyone else. MR: Nice. And, of course, I have to ask, have you ever thought of doing a Dan Zanes music meets the Del Fuegos music album? MR: Now, about that Del Fuegos reunion album... see where I'm going here? DZ: Well, I don't know. We might kill each other. (laughs) Playing shows is kind of easy because we have the material, but I think if we went further, it might get ugly. (laughs) But you never know, I love these guys. I never thought we'd play together again, and here we are thinking about a Northeast tour so I guess anything's possible. MR: You'll have to keep me updated and come back for an interview if it ever happens. MR: Great. Dan, do you have any advice for new artists? DZ: I think now more than ever the important thing, besides learning how to or interpret write songs, is, really, to learn how to play live, only because the chances of making money off of record sales are less and less every year. But, I think if you can become an interesting, exciting, and engaging performer, that's something that people are always gonna want. Nothing can replace an exciting performance, so learn to play live. Play as much as you can and don't think about money, think about your future as a performer. MR: Nice. Do you have anything coming up in the future that we should be looking out for? DZ: Right now, I'm in the process of putting together one, maybe two festivals for next year. The first one will take place at the Massachusetts Museum of Contemporary Art in Western Massachusetts -- that's where Wilco does their Solid Sound Festival. That'll be a family festival, and it'll look like it looks when I walk onto the streets of New York -- looking out into the audience and wondering where everyone is from and how they came to be here. The big challenge is to make sure that everyone in the audience feels like they're a part of the party. This whole thing is sort of the dream of a lifetime to me. I've also recently met with someone who works extensively with African refugee resettlement, mostly in New England, because I know there are a lot of musicians that have settled in the New England area who would be incredible guests to have at the festival. But ultimately, doing these festivals opens up all of the possibilities that I've been thinking of over the years. I'm really grateful to get the chance to do this, so I'm trying to seize the moments as they come. MR: Do you feel like as a society, we are making decent strides towards creating an atmosphere where it feels like everyone is "invited to the party"? DZ: You know, I don't know that we are. I think it's really up to white people to begin to wake up and look around. We have to realize that we were the dominant group for so long. I'll still do really eclectic shows where a number of different artists from different genres come in and play. I have done shows where the entire line up is white and it still makes me think, "How could that be?" And as white people we don't notice that, a lot of times. But I know that everyone else does. So, it's a matter of gaining awareness. If you look at everything from TV to magazines, you can see it, so I think a really important step is for white people to realize that. Times are changing anyway -- pretty soon white people won't be the majority anymore. That will happen in our lifetime, and it'll be a huge, huge shift. But it'll be a great one. It's time for things to change. MR: Nicely put, Dan. Thank you so much for your time, it was great, as usual. DZ: It was my pleasure, Mike. Thank you so much.